The Miami Trace varsity volleyball team (left) hosts Washington for the final high school varsity sporting event in the Panther Pit on the campus of Miami Trace High School Thursday, Oct. 4, 2018. It’s going to be a long time gone. The Panther Pit gymnasium on the campus of Miami Trace High School held the final high school sp0rting event when the Lady Lions of Washington High School brought their volleyball teams to take on the Lady Panthers Thursday, Oct. 4, 2018. Washington won the match in straight sets: 25-20, 25-16, 25-20. Statistically for Miami Trace: Laura Robinson had five kills, Ashley Campbell had four kills, Olivia Fliehman had seven blocks. Statistically for Washington: Rayana Burns led with 15 kills, Hannah Haithcock had 10 kills, Brittney Wilson had three kills, Maddy Jenkins had two; Burns led in serving with six aces, Tabby Woods had three; Aaralyne Estep led with 16 digs, Woods had 11 and Haithcock had nine; Burns had three solo blocks and one block assist, Wilson had two solo blocks and one block assist. Washington ends up in second place in the Frontier Athletic Conference with a record of 8-2. “You have to hand it to Chillicothe,” DeAtley said of the two-time FAC champions. “They beat us twice and they’re a good team. We’ll set some goals and go after the title again next year. “After Homecoming, we’ll refocus on our game situation,” DeAtley said. Washington will host Leesburg Fairfield Monday at 5 p.m. The tournament draw will be announced Sunday afternoon. Miami Trace won the junior-varsity match 25-23, 25-23. Taking a look at the final FAC volleyball standings, released by conference commissioner Terri Tutt, Chillicothe finished at 9-1. Washington was second at 8-2, followed by Jackson at 6-4. 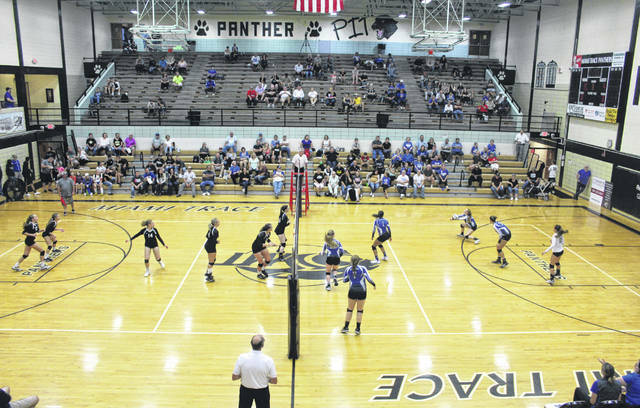 McClain was fourth with a record of 4-6, followed by Miami Trace at 3-7 and Hillsboro at 0-10.
https://www.recordherald.com/wp-content/uploads/sites/27/2018/10/web1_Final-volleyball-match-in-the-Panther-PIt-10-4-2018-1.jpgThe Miami Trace varsity volleyball team (left) hosts Washington for the final high school varsity sporting event in the Panther Pit on the campus of Miami Trace High School Thursday, Oct. 4, 2018.